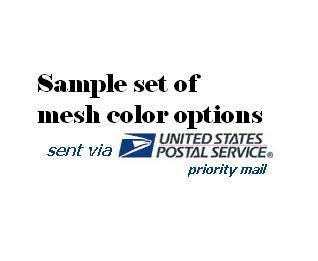 This is a sample pack of the colors with our mesh pool fences. If you are having trouble deciding on a color or you want to get your hands on our mesh prior to committing to your pool fence order; have one of our samples shipped today. We will ship the sample out Priority Mail the next business day after you order. If you decide to order our fence the price of the sample (not including the shipping charge of the sample) can be deducted from your order if it is exceeding $100 by adding the sample refund to your cart found on the left side of this screen.